(Photo: Reuters / Stefano Rellandini)Pope Francis blesses the Harley Davidson bikers from his Popemobile before the start of a mass outside Saint Peter's Square in Rome June 16, 2013. Along with pealing bells, the roaring of around 35,000 Harley Davidson motorcycles mingled with prayers Sunday in the Eternal City where Pope Francis blessed bikers. 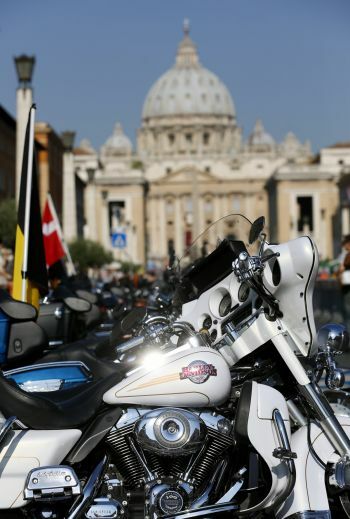 (Photo: Reuters / Max Rossi)Harley-Davidson bikes are parked outside Saint Peter's Square before the start of a mass led by Pope Francis in Rome June 16, 2013. 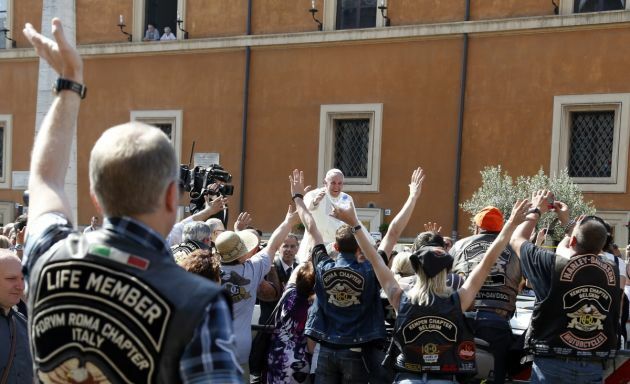 "I greet the many participants of the Harley-Davidson motorcycle rally, and also those of the State Police Motorbike club," said the Pope during his weekly Angelus blessing. Alongside the bikers at the Vatican, Catholic faithful were taking part in a pro-life rally that was not related to the motorcycle celebration. "I am pleased to recall that yesterday, in Carpi, Oduardo Focherini, husband and father of seven, journalist, was proclaimed Blessed. "Captured and imprisoned because of hatred against his Catholic faith, he died in the concentration camp of Hersbruck in 1944 at the age of 37. He rescued many Jews from the Nazi persecution. Together with the Church in Carpi, we give thanks to God for this witness to the Gospel of Life!" said Francis. The bikers invaded Rome the 110th anniversary celebrations of the American motorcycle maker's founding. Among leather and denim-clad bikers sporting tattoos prayed nuns, priests and other faithful. Early Sunday, Cardinal Angelo Comastri from the Vatican's Basilica, said Mass in St. Peter's Basilica for 2,000 of the participants. Later 1,400 bikes along with their riders were blessed by Pope Francis at the Sunday Angelus as the Via della Conciliazione leading up to the square which was a parade route for the motorcyclists. Bikers came from many parts of Europe and different parts of the world, and some rode from St. Petersburg, Russia. On Wednesday, as part of the Harley Davidson company's 110th anniversary celebration, the Pope was given two Harley Davidson motorcycles. Francis' predecessor, Emeritus Pope Benedict had signed one of the bikes which will be sold for charity at auction and the other will be on display at one of the Vatican's museums. The Pope was also given a black leather Harley jacket, and some riders were hoping they might see the Pope, who is known for breaking convention, riding one of the iconic bikes with a leather jacket over this traditional white cassock.